This entry was posted in Uncategorized and tagged Boston Globe, civil rights, editorial, humble, opinion, Trayvon Martin, We've Got a Job. Bookmark the permalink. Thanks for this important piece, Judy. It’s powerful and resonates deeply with me regarding the injustice that occurs so rampantly. Thanks for your voice. Thanks so much for sharing this, Judy. You powerfully articulate the rightful rage over injustice that occurs so rampantly. And your inclusion of Cynthia Levinson’s book is so, so apt in this moment. Thanks, Luke. Wouldn’t it be wonderful if I was never driven to write this kind of post again? 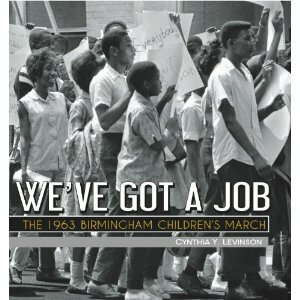 Judy, thank you so much for mentioning my book, WE’VE GOT A JOB, especially in such a thoughtful context. I recently had a similar conversation with my sister, whose political views are very different from mine, when she asked me whether a residue of racism and reactions to it linger in Birmingham. Because I don’t live there, I couldn’t answer her question. But, I know that at least one of the people I interviewed for the book is outraged by the Martin/Zimmerman case and another, who told me that he learned to be and remains attuned to subtly nuanced racism, is deeply saddened. My discussion with my sister was fascinating–and upsetting–because we both understood that racism and reactions to it remain; however, while I am both saddened and outraged, she seems suspicious. It’s as if our political intuitions take wholly divergent paths. Thank you for promoting such interesting insights. Thanks for this, Judy. Really like your point. Also the detail about the segregated bathrooms. Very poignant in its simplicity. I just really do not like the fact that skin color still makes a difference. Humble really hit home for me. I’ve never been black but I did grow up in a demilitarized zone – B’klyn and Queens, NYC. Playing humble to authority – translation: COPS – was de rigueur. Nobody, then, was taught (by experience or otherwise) to role out the humble pie for anybody else. Fact is, I soon learned that aggression in the face of Zimmerman style aggression was the right way to respond. I suspect that Trayvor, being bullied by Zimmerman , stood up to the prick. Self-righteous wimps like Z are bad; obviously, they are much worse when armed and pseudo-empowered. F him. Loved the piece, Judy. Really touched me. Keep it up. Excellent piece, Judy. NPR interviewed people about this issue. The feeling was that the fight should be outside of the situation. Agitate to the media and political figures and the police at other times. In the moment, stay safe. We can cry against it, but if I had a black son, I’d give him the same advice. I’d want him to be alive foremost. I am also saddened by how little has changed. As much change as there has been, too many hearts aren’t open.